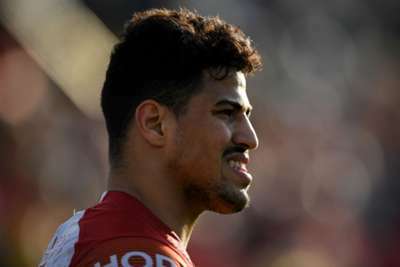 Fouad Yaha scored four tries as Catalans Dragons completed a gutsy comeback to beat Leeds Rhinos 26-22 and inflict further misery on Super League's bottom club. The beleaguered Rhinos - still with only one win under David Furner in 2019 - raced into a 12-0 lead in Perpignan on Saturday thanks to two converted scores from Ash Handley, who went on to complete his hat-trick in the second half. However, fellow wing Yaha proved the match-winner as the Dragons, boosted by an energetic cameo off the bench from new signing Sam Kasiano, prevailed. Handley's first try came against the run of play and Leeds were facing further pressure when he intercepted a Tony Gigot pass and ran 85 metres to dot down, with Liam Sutcliffe - starting at stand-off ahead of Tui Lolohea - converting on both occasions. Yaha responded after Tom Briscoe dropped a high kick, but Konrad Hurrell restored a two-try advantage for Leeds before Kasiano's introduction sparked Catalans, for whom Remi Casty made his 300th appearance, into life. Good work from Brayden Wiliame enabled Yaha to go over again following a series of powerful runs from Kasiano and a Lucas Albert try levelled the score with the Rhinos temporarily down to 12 men due to the sin-binning of Brett Ferres. Handley took a looping pass from former Catalans playmaker Richie Myler in the second half to score his third try, but another glorious Wiliame assist led to Yaha's hat-trick score and the same man surged over again to seal victory after Sutcliffe's penalty had briefly got Leeds back on level terms. The Dragons climb up to fifth in the table, while Leeds and reigning champions Wigan Warriors continue to make up a surprising bottom two.